Schwartz Bioresearch Caralluma Fimbriata Review - Does It Work? 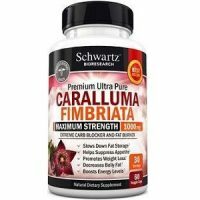 This is a review of Schwartz Bioresearch Caralluma Fimbriata, a supplement that is a 10:1 Caralluma Fimbriata extract, that was formulated by doctors and researchers to create a weight loss product that would serve as an appetite suppressant. It was designed to be a product that would not cause side effects that typically come in supplements where the caffeine levels are too high. Working directly on the hypothalamus, which is considered to be the appetite control center of the brain, this supplement interrupts the signal to the hypothalamus which allows you to feel less hungry and therefore reach your goals around weight loss and better health. What’s in Schwartz Bioresearch Caralluma Fimbriata? This product comes in a vegetarian capsule suitable for vegetarians and vegans alike, with no fillers and binders. It is free of soy, gluten, milk, egg, wheat, GMOs, peanuts, sweeteners, shellfish, and sugar. These ingredients certainly reflect a natural formula for this product, however, studies recommend a daily dosage of 1600mg of Caralluma Fimbriata for effective results. The recommended dose for this product is only 1000mg which falls short of the optimal daily amount. How Do You Use Schwartz Bioresearch Caralluma Fimbriata? According to the product label, 2 capsules can be taken daily with the recommendation to take them 20-30 minutes before a meal with 8 ounces of water. It is possible that Caralluma Fimbriata will cause mild stomach upset, intestinal gas, constipation and stomach pain. Consultation with your healthcare professional should be made with any side effects you may experience. 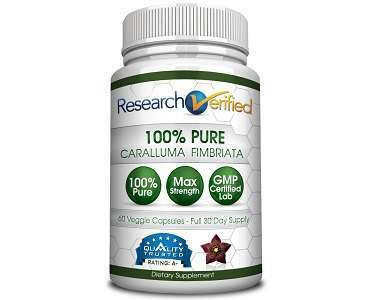 The manufacturer’s website sells Caralluma Fimbriata extract for $16.95. Otherwise, you can buy it from a third party website for $15.35 unless you sign up for a regular subscription of this product whereas the price is $14.58. There is a money-back guarantee mentioned in the FAQ section of the manufacturer’s website, however, there are no other details offered whatsoever about what the guarantee does or does not cover. The guarantee states that if you don’t like the product, that they will refund the money with no questions asked. 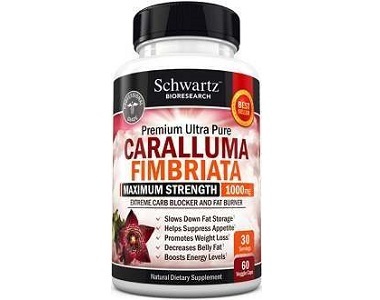 Made in the USA and third-party tested, the Schwartz Bioresearch Caralluma Fimbriata supplement is an all-natural product that helps suppress the appetite and slow down fat storage while giving you that extra boost of energy. It is certainly a bonus that it is suitable for vegan too. However, the actual dosage of Caralluma Fimbriata is 1000 mg a day which is less than other leading competitive products where the supplements are 1600 mg a day. This 600 mg differential can add to a great difference in the total effects of the overall supplement. With weight loss as the primary goal for consumers taking this product, it can feel frustrating to not get the results you hope to achieve. Additionally, the manufacturer makes a very generous promise about a guarantee for the product but it does not stipulate what exactly the nature of it is.